Today I want to share with you a guide to wearing bohemian style. We are going to take a close-up look at this marvelous collection of street style images where ladies appear in 1970’s inspired, free-spirited outfits. The bohemian flair can be be brought in your everyday life by sporting fringes, nomad prints, relaxed clothes and eye-catching accessories. Each one of these outfit ideas will express yourself, all you need is to choose funky elements that are not only chic and vintage, but also exotic and ethnic. Don’t forget about layering, oversized and relaxed shapes, statement accessories, like flower crowns, necklaces, rings and bracelets. Personally, I recommend to think of wearing lace, fringes and charming prints. I rounded up my favorite bohemian looks for you. Scroll down to see my favorite bohemian style outfit ideas. Don’t forget to tell me your thoughts in the comments below. We see two young ladies clad in bright clothes. The first girl is wearing a paisley printed bomber styled with a cream white tee and washed blue denim shorts, whilst the other one is wearing a V-neck tunic dress in Paisley print completed with gladiator lace up sandals. Let’s speak about boho looks. In today’s post I want to share with you my favorite outfit ideas for bohemian and hippie lovers. There are so many interesting outfits to copy this year, all you need is to take a close-up look at these wardrobe ideas. The following compilation is ideal for music festivals like Coachella, simple day walks on the town, beach walks, laidback weekends, getaway trips and home gatherings. Think of fringe, florals, beads, kimonos, fedoras, crochet and lace. There are new and sophisticated ways of dressing boho. All you need is to know the right balance. The showcased looks are ideal for ladies who want to show-off their individuality. Check out my favorite ways to style lace trimmed dresses, jeans and cardigans to look like a free spirited lady without overdoing it. Make some fun with a khaki-brown knitted high-neck top and matching shorts. Complete your look with a sheer black fringed kimono, wide-brim camel hat and cool trainers. Hi there! This time we are going to talk about boho chic outfit ideas. In this compilation I gathered inspirational looks that will easily make any lady look unique and boho-chic. Why do I like this look so much? It will always be in trend. This timeless style is all about creativity and uniqueness. Believe me, boho-chic will never go out of style. If you want to look natural and hippie inspired, then you better keep an eye on bold colors, bright prints, splashes of colors, fancy boots, midi skirts, fringes, ruffles, natural jewelry, etc. Free-spirited looks work ideal for any season. 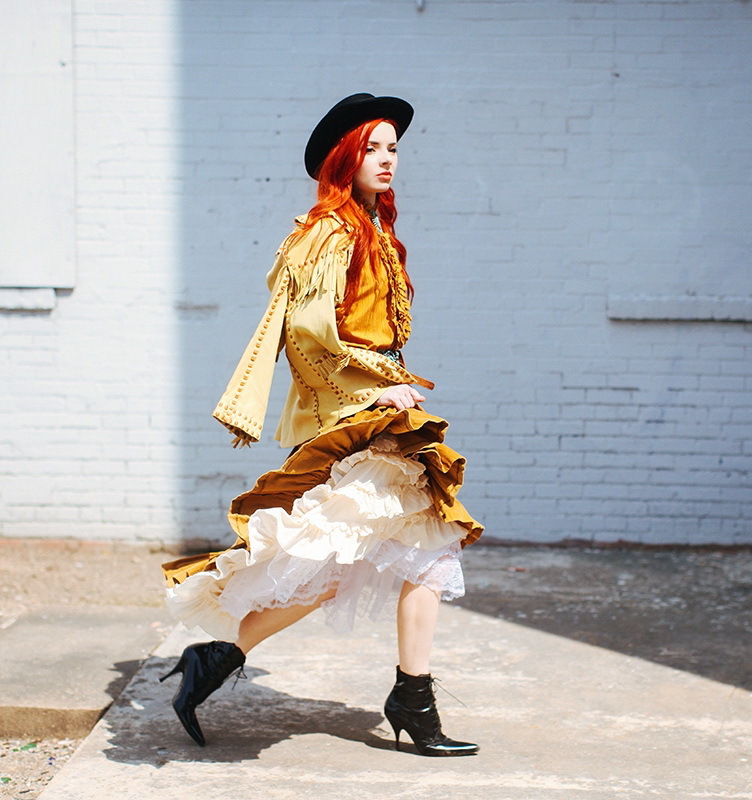 Redhead lady appears in a black brimmed hat, flowy jacket embellished with fringes and styled with ruffled long dress. In love with stiletto ankle-boots.